Fear. It shows up in nearly every coaching conversation I have. Sometimes it’s bold and in-your-face and can’t be denied, and sometimes it’s sneaky and disguised as anger or laziness and has to be coaxed out into the light. Fear fills a lot of pages in self-help books. Everyone’s trying to master it. Some tell you to befriend it, others tell you ignore it, and still others tell you to stare it in the face. 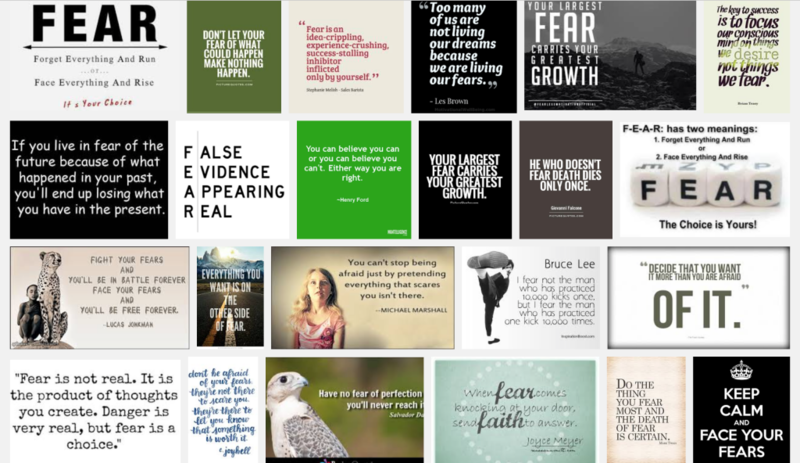 Do an image search of fear quotes (see above image) and you’ll find endless memes about how you can conquer, befriend, embrace, or ignore fear. Or, if you’d rather, you can dance with it, kick it to the curb, or pray it out of existence. The problem with much of what is written about fear in self-help books is that it is oversimplified. Diminish fear into only one dimension and it’s easier to give you a meme-worthy quote about it. But fear is a multi-dimensional creature that requires a multi-dimensional response. It can’t be contained to a simple meme or a singular response. Diminishing the complexity of fear can have devastating results for those who read self-help books. Sometimes clients come to me even more beaten down than they were before they read the books. Now, not only do they still have the fear, they have accompanying shame that they weren’t able to address their fears the way the self-help books told them to. Ego fear. This is the kind of fear whose job is to keep our fragile egos safe at all costs. It’s the fear that tells us to stay small, to not ask for too much, to avoid shaming ourselves. It’s also the fear that tells us to protect ourselves from people who don’t look like us or who don’t share our belief systems. (Sadly, it’s the kind of fear that seems to be making far too many political decisions these days.) This is the most slippery of the fears. It’s hard to pin down and it’s got a million ways to lie to us. It’s the kind of fear that many of the self-help books are talking about when they tell us to befriend our fear or let it take the passenger seat in the car. This fear needs to be examined and deconstructed so that it doesn’t control us. Invitational fear. Sometimes, what feels like fear, is actually a message from our bodies that we are on the right track, that we are about to step into something important and life-changing. It’s an invitation rather than a warning. I often refer to this kind of fear as “the trembling” because, for me, it’s often accompanied by a physical vibration in my body. This is the kind of fear we befriend, because it leads us into our right work, art, relationships, etc..
Trauma fear. Trauma has a way of embedding fear so deeply into our bodies that we can barely understand it or control it, let alone conquer it with a few tips from a self-help book. Trauma changes us so fundamentally, that it’s been known to alter not only our DNA, but the DNA we pass down to our children. Some of our trauma fear has, unbeknownst to us, been inherited from generations before us. Trauma fears are often irrational and can flare up at the slightest trigger, causing a fight, flight, or freeze reaction that nobody who’s witnessing it can understand. To treat this kind of fear with a simple self-help book approach is to do an egregious disservice to the person who’s suffered from the trauma. That’s like giving an aspirin to a cancer patient and telling them to go home and think good thoughts. Instead, you need to seek out the right expert who can provide support, tools, body exercises, etc. to help you understand and cope with the long-term impact of the trauma. So… how can you tell which kind of fear is showing up for you? There is no simple answer to that. Instead, there’s a life-long practice of mindfulness, discernment, and experimentation. Be quiet. Unless the fear demands an instantaneous response (ie. swerving out of the path of a car), give yourself a time-out when fear shows up and be quiet with it. Go out into nature or sit on a meditation cushion and let your fear know that you are willing to listen. Noise and/or the wrong person’s advice can intensify the fears, so find a place to be quiet and honest with yourself. Be alone or with someone who knows how to hold space for you. Ask what the fear is trying to protect you from. An honest inquiry can help you discern whether the fear is rational or irrational, a warning or an invitation. This is something I often do in my journal, by starting with a few prompts such as “I feel fear about… This fear is trying to protect me from…” Keep writing until the fears beneath the surface start to tell you their truth. Ask whether you can and/or should survive whatever your fear is trying to protect you from. If it’s a warning fear, then just because you CAN survive it doesn’t mean you SHOULD. Act accordingly. If it’s an ego fear, then what it’s trying to protect you from is probably worth surviving because it will mean you’ll move into greater freedom and/or authenticity. Again, act accordingly. Consider whether you need outside help addressing the fear. If you can’t understand or address the fear by doing the above-mentioned practices, it may be time to seek professional help. If the fear seems irrational and easily triggered, look for a therapist with expertise in trauma. (I would especially recommend someone who takes a wholistic, body-centred approach and who understands that trauma can’t simply be treated with talk-therapy.) If it doesn’t seem to be trauma-related but is instead connected to some old stories you’ve been telling yourself, coaching might help, but be discerning about who you choose for a coach. Someone who glosses over the complexity of fear will not be the right person. There is nothing wrong with turning to self-help books (I’ve read quite a few myself), but if you find that those books make you feel worse about yourself instead of better, they might not be the right books for you. You have the right to toss them in the recycling bin, even if everyone else in your social media feed seems to be eating them up. Seek out what’s best for you and do the work that heals you and makes you stronger. Note: If you’re looking for a coach, perhaps I can help. Check out my coaching page and book an informal conversation (for free) if you’d like to explore what our relationship might look like. I will be happy to work with you AND I promise that if your fears are beyond my capacity to support (ie. trauma fears), I will help you seek out the right kind of therapeutic support. Interested in more articles like this? Add your name to my email list and you’ll receive a free ebook, A Path to Connection and my weekly reflections.